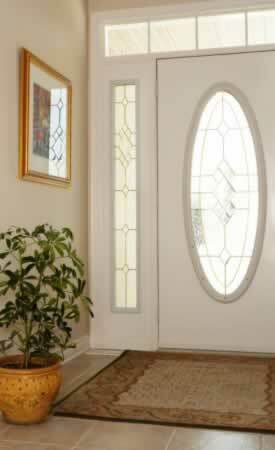 Contemporary manufacturers have recreated classic oval glass doors that fit modern homes or renovated beauties. The oval design is a great choice if you want to distinguish your home from the pack. The leaded-glass effect in the entry door caming, sidelites, and casing resemble pricey wooden forebears of yore. But the comparison ends there. Affordable, modern glass doors have a greater insulating property than wood, and require minimal care to last a long time. Doors can be created just for you in an extensive palate of colors and panel designs and, unlike wooden originals, these glass doors come outfitted with contemporary security hardware matched to the design. These glass doors won't crack, warp, or chip, and clean up simply with mild soap and water. You can retire your paint scraper permanently.